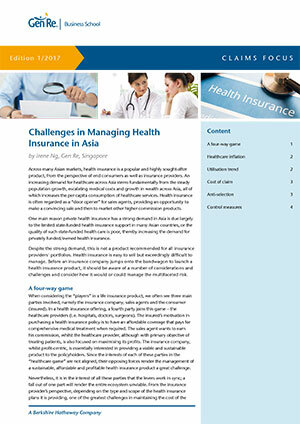 Managing and maintaining a sustainable health insurance (hospital reimbursement) portfolio is often a challenge. Very often insurers face claims rates rising faster than inflation of health expenditures in the general population. Singapore’s national health insurance scheme (MediShield) has often been viewed as one of the more successful public-private partnership schemes that provides long-term coverage to citizens and permanent residents. However, the MediShield is not without its own set of challenges. This article provides a background to the Singapore MediShield programme and to how the government, healthcare providers, consumers and insurers work together to manage the rising healthcare costs to ensure sustainability of the scheme. MediShield was first introduced in 1990 as part of the Singapore government’s approach to keeping healthcare affordable for its citizens. Commonly termed as the 3M approach (Medisave, MediShield, Medifund), the government, through heavy subsidies of healthcare cost, uses these 3Ms to ensure every citizen has some form of savings in every healthcare need. Medisave, the first of the 3Ms, is a national medical savings scheme which helps individual set aside part of their income into the Central Provident Fund (CPF) Medisave Account to help pay for (own and family members’) healthcare expenses. The second of the 3Ms is MediShield, an affordable major medical insurance scheme that helps meet the cost of more expensive treatment or prolonged illness. Premiums for MediShield can be paid using Medisave funds subject to an annual limit. The focus of MediShield cover is not to pay for low cost treatment, which can partially be funded using Medisave or out of pocket, nor is it meant to cover the more luxurious hospital stay in a single or double bedded ward. Instead, to keep the premium affordable, the basic MediShield covers admission into Class B2 or C wards (i.e. 5 to 9 bedded wards), and has an annual deductible and co-insurance features, as well as inner limits on the maximum claimable amount for certain procedure or treatment. The last M, Medifund, is an endowment fund set up by the government as a safety net to help needy citizens who are unable to afford even the most heavily subsidized medical care. With the changing healthcare landscape and ageing population, the original MediShield coverage was no longer adequate for the welfare of the citizens. A major revamp of the MediShield coverage was introduced on 1 November 2015 and was replaced by MediShield Life. The key enhancements to the coverage included higher payouts so that out of pocket expenses are reduced for larger hospital bills, universal coverage for all citizens and Permanent Residents for life, and coverage of pre-existing conditions. The cost of covering serious pre-existing conditions is borne mostly by the government, with the policyholders paying only additional 30% of premiums over 10 years to reflect their higher risk. Since 2005, due to keen competition amongst the private IP providers, coverage scope under IPs expanded so that most plans today cover claims on an “as charged” basis with generous annual and lifetime limits. As the regulated IPs have a mandatory deductible feature of up to SGD 3500 per annum and co-insurance of 10% in addition, IP insurers also offer rider plans that “plug the holes” not covered under the regulated IPs, thereby providing first-dollar coverage on every hospitalization. As at March 2018, about 1.1 million (about 41%) of IP policyholders also bought a rider plan. Table 1 provides a sample comparison of coverage under MediShield and the new MediShield Life, as well as an example of a private Integrated Shield Plan. 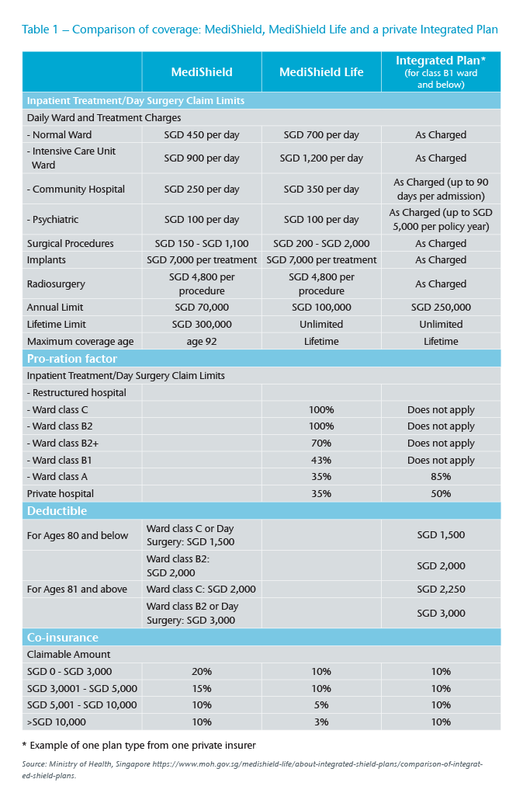 The full spectrum of coverage scope from all six IP insurers and different plan types can be found in https://www.moh.gov.sg/medishield-life/about-integrated-shield-plans/comparison-of-integrated-shield-plans. Inflation of medical-related expenditures in Singapore has been running at about 50% above that of general inflation over last decade.2 With the expanded coverage of IPs and first-dollar coverage of rider plans, it is not surprising that by 2016, all six IP insurers reported underwriting losses of between SGD 7.3 million to SGD 29.2 million, as seen under the mandatory financial filings.3 All six insurers reported a second year running of underwriting losses in 2017, totaling SGD 146 million.4 Since the introduction of IPs in 1994, insurers have been improving their operation efficiencies with reduction in management expenses and distribution costs. However, these savings have been unable to translate to reduction in premium for consumers as the counter increase in insurance claims outweighs such savings. In a bid to ensure that health insurance remains affordable and to curb the escalating medical inflation, the insurance industry gathered relevant stakeholders – including healthcare providers, relevant government bodies and industry associations – to form the Health Insurance Task Force (HITF) in February 2016. The main tasks of HITF are to evaluate the causes of rising claims and to recommend measures in the short-to-medium term to moderate the escalation of IP premiums. 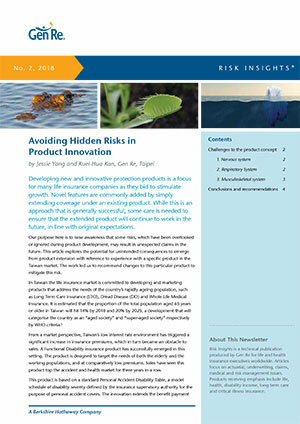 In its report published on 13 October 2016, the HITF put forth a set of recommendations based primarily on the findings from a study conducted by the Life Insurance Association of Singapore (LIA) on the key contributing factors to rising IP claims. The full set of recommendations can be found on the side note on this page. IPs claim incidence rate increases at a higher rate than general population at 9% vs. 4%. Plans with lower Ward-type entitlements have higher claims incidence rate than plans with higher Ward-type entitlements. This is due to the higher average attained age of policyholders with lower Ward-type entitlements plans. Although plans with IP riders have only slightly higher incidence or utilization rate, there is clear indication of higher propensity to utilize private hospital services than policyholders without a rider plan. The inflation rate of average hospital bill sizes at private hospitals is higher than public hospitals, with differences about two times the cost for inpatient treatment, 2.5-3 times the cost for outpatient treatments, and 4 times the cost for day surgeries. Costs for various components of inpatient hospital treatments are higher in private hospitals compared to public hospitals. The biggest differential arises from surgery charges at 2-2.4 times in costs. There is a high tendency to utilize public hospitals for more complex procedures. Policies of IPs with IP riders have higher average bill sizes, averaging 20%-25%, than those with only IPs. With the introduction of MediShield Life in 2015, some savings should accrue to the private insurer’s share under the IPs and IP riders due to the higher coverage scope of MediShield Life. However, this savings will not be adequate to offset the higher claims incidence rate and higher claims cost expected. Since the publishing of the HITF report and recommendations, the Ministry of Health has been working with the industry and relevant stakeholders to implement measures to decelerate medical inflation and curb the rising MediShield and IPs claims. Below are some actions that have been implemented or will be introduced in the coming months. The Singapore Medical Association (SMA) removed its Guidelines on Fees in 2007 as it was deemed anti-competitive. This removal has been blamed as one of the triggers to rising medical charges over the years as the absence of fee benchmark or guidelines makes it difficult for insurers or consumers to challenge charges made by doctors and hospitals and to detect inflated claims. Following the HITF recommendation in 2016, the MOH established a 13-member committee to come up with “reasonable” national benchmarks for medical fees on common procedures. This first set of fee guidelines, which account for 80%-85% of operations done in Singapore, will be introduced by the second half of 2018. The guidelines will further expand following this first release to eventually include benchmarks for consultation fees and laboratory charges. With the re-introduction of medical fee benchmarks, the hope is that insurers will be more empowered to detect inflated claims and take effective actions towards claims adjudication. To enable better management of health claims costs, the HITF recommended IP insurers consider appointing a panel of preferred healthcare providers and introducing a “pre-authorisation” framework prior to a medical procedure. In January 2018, the LIA published a memorandum of understanding for all IP insurers entitled “Good Practices on panel of preferred healthcare providers” and separately, a “Good Practices on pre-authorisation framework/process”. These memorandums encourage IP insurers to be transparent with customers with regard to these changes to the IP coverage. The selection criteria for panel healthcare providers and the list of their names should be made available and easily accessible to customers, and the provider list should be regularly updated. Customers should also be advised on the impact to their coverage if they decide to use a panel provider or not. If customers decide to seek treatment outside the panel, insurers should also provide alternative options to such customers. Under the “pre-authorisation framework”, insurers should clarify the process and terms and conditions surrounding pre-authorisation. Customers should be made aware of the benefits of going or not-going through pre-authorisation and how that could potentially impact the policy coverage. The aim of implementing pre-authorisation is to benefit all three stakeholders – the insurer, the patient (policyholder) as well as the healthcare provider. With this aim in mind, the process of implementation should take care of the interests of these stakeholders. One of the most significant changes to the Singapore health insurance framework following the HITF recommendation is the change to the product features of IP riders, announced by the MOH in early March 2018. In this change, it has been made compulsory for all IP riders to be sold from 1 April 2019 onward to include a mandatory co-payment – a minimum of 5% of a hospital bill. The annual co-payment amount will be capped if the policyholder selects treatment by the insurer’s panel doctors or obtains the insurer’s pre-authorisation for seeking treatment outside the insurer’s panel. This cap will ensure that the total healthcare cost remains affordable to the consumers. However, if the policyholder opts for treatment outside the preferred healthcare providers or does not seek pre-authorisation, this cap will no longer apply. These features will encourage consumers to be conscientious in choosing their medical providers and treatments as they will have “skin in the game” in managing the healthcare expenditure. Individuals who purchase a full rider between 8 March 2018 to 31 March 2019 will be required to switch to the new co-pay rider by 1 April 2021. All IP riders purchased before this date of announcement will not be affected by the change. With the keen interest of the Singapore government and IP insurers in keeping down the cost of health claims, and with the various measures undertaken or in the pipeline to better manage and balance the interests of all the stakeholders, the medium to long-term hope is for the MediShield Life and Integrated Plans to remain affordable while providing universal coverage. Naturally, higher healthcare expenditure comes with an ageing population, and so the Singapore government is also embarking on measures to encourage healthy living and early disease detection to slow this wave of rising medical expenses. 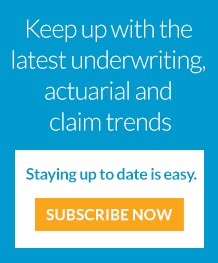 With the recent report of high underwriting losses for all six IP insurers for a second year running, despite a premium increase a year ago, consumers are facing the imminent possibility of yet another premium hike. Without more drastic changes to curb these losses, consumers will soon be facing rising premiums that could lead to unaffordability for more people. Will Singapore find the magic formulae with the implementation of the various changes discussed here? This possibility is certainly promising, but time is needed to turn the ship around and also to change consumers’ behavior in managing their health expenditures in more responsible ways. Singapore Department of Statistics (SDOC), Consumer Price Index from 2005 to 2015, http://www.tablebuilder.singstat.gov.sg/publicfacing/mainMenu.action. Monetary Authority of Singapore (MAS) website. The Straits Times, 25 June 2018, “IP insurers’ losses raise possibility of premium hikes”.